MISSOULA, MONT. 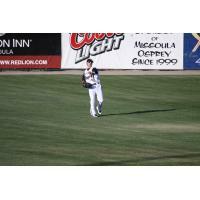 - Outfielder Ender Inciarte (Atlanta Braves) of the 2009 Missoula Osprey was awarded with a Gold Glove as the National League's top defensive Center Fielder on Sunday. Inciarte, who has developed a reputation around Major League Baseball, lived up to his name by ending numerous bids for a hit with spectacular catches. He finished ranked among the top three in the Majors in 6 advanced defensive metric categories; Putouts as OF - 380 (1st ), Double Plays Turned as OF - 3 (1st ), Range Factor/9inn as CF - 2.76 (1st ), Total Zone Runs as CF - 11 (3rd ), Defensive Runs Saved as CF - 17 (2nd ) and 21 outs above average(1st ).